Words by Kevin Doocey on January 31, 2019 . There was nothing unusual to the start of week at Newcastle United. It followed the same pattern as most others this season, constant rumours that Rafa Benitez was close to the exit door, and the trickle of transfer talk as January came to a conclusion. Murmurs of Benitez’s departure intensified as he gave the strongest indicator to date that he could walk away before the end of the season. It was a frank answer, and hardly unexpected, but it started the ball rolling for a pretty mental few days on Tyneside, even by North East standards. All the while the Spaniard was prepping his players for the visit of defending champions, Manchester City. With a title race beginning to swing into full motion, Guardiola’s men arrived at St. James’ Park with an expectation of comfortable victory. Odds of 16⁄1 on Newcastle United winning the game confirmed sentiment. Coupled with a planned protest & an injury plagued midfield, it looked to be one of the bleakest nights on Tyneside for a while. But the madness had only begun. By the time kick-off came around, there was change in mood, on the transfer front, at least. 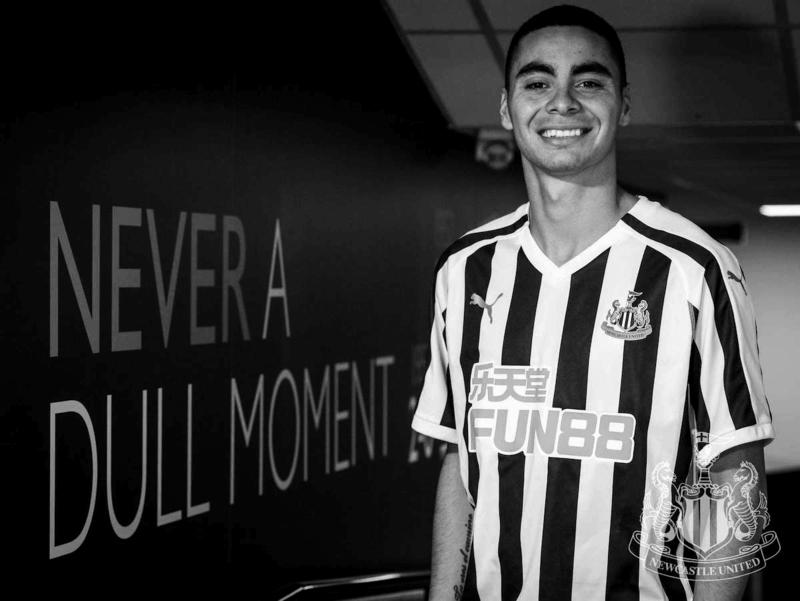 A long, tiresome pursuit of Rafa Benitez’s main transfer target, Atlanta United FC creative midfielder Miguel Almiron, broke new ground. News emerged from the US of the two clubs agreeing a fee and the Paraguayan was en route to Benton for a medical before confirming a move. Mr. Benitez seemed cheerful arriving at the stadium ahead of the game, having been fed the good news. Now it was onto the small matter of playing the most talent-fastened team in the league. 24 seconds after the referee signaled a start to the 95 minute long affair, the visitors took the lead in truly diabolical circumstances. NUFC pushed oddly high from kick-off, and were caught on the counter, with Sergio Aguero scoring his customary goal. What a brutal opening. Fast-forward to half-time and Newcastle were still in with a shout. 66’ minutes in, and St. James’ Park erupts, as Salomon Rondon stabs home an equaliser with the side’s very first shot on target. The #9 again proving his worth as a key player for Rafa & the club. Just a half hour to hold on to a precious point, right? At Newcastle United there’s always a kicker. Late drama is ingrained in the fabric in the club. One would not have expected fortune to favour the men in Black and White in this affair, but so it did. Some good pressure from DeAndre Yedlin down the right forced City to speed up their passing from the back, and within seconds Fernandinho was caught unaware that young Sean Longstaff was breathing down his throat. The local lad nipped the ball off the Brazilian’s toes in the area before being taken down for a clear penalty. Again, SJP erupted. Minutes after awarding the penalty (and what seemed an eternity), up steps Matt Ritchie to blast home. An under-strength NUFC were beating the Champion, and had 10 minutes to see it out, with a twelfth man in the stands. The lads defended brilliantly, and limited City’s ability to find space. They showed discipline late-on, and coupled with tactical nous, they managed to see it out. A fantastic 2-1 victory to ease further away from the relegation zone. It was a sweet victory. Arguably one of the sweetest I can remember in a long, long time. To concede after just 24 seconds and come from behind to win was remarkable. To do so with a midfield pairing of Isaac Hayden and Sean Longstaff borders on ludicrous, and to hear Pep Guardiola comment on how his side couldn’t deal with NUFC’s center midfield was, well, quite the testament. Following Newcastle United is never easy, and it reached somewhat of a low at the start of the week when Rafa hinted at an early exit, and no incoming transfers in sight. In the space of hours, how things changed. A new record signing, three unlikely points, and a happier Benitez - NUFC is one crazy club. It is still worth remembering that this January window has been a disappointment a whole, and we are still under-strength. It’s also daft to think Benitez is eager to stay beyond the summer as things stand, but, we’ve bought some time. From now until May we have to do enough to stay in the league, and who knows what might happen on a ownership front. Before the turn of the year I wrote how the club were playing Russian roulette. Nothing changes in that regard. Nights like Tuesday give us a glimpse into what kind of club Newcastle United could be when run properly, but it’s the hope that kills you, each and every time. What a mental football club. Feel free to lambast in the comments above, or reach out Twitter @KevinDoocey.